Doggles - ILS Pink Frame with Flowers Lilac Lens Customer Photos - Send us your photo! Fifi Pink Princess walking on the sun. Gracie is a 4 mo old shih tzu, learning to wear her doggies so she can protect her eyes and look stylin this summer ! ?? Me and my sister love our new glasses. We're ready to hit the beach!!! My dogs are so happy with their new doggles! They look adorable and it's great for the summer sun. Tahiti loves riding down the back roads with her Doggles on! Mazzy is aMazzy-ing! She is a total celeb when we go out, whether shopping at the mall or a stroll at Riverwalk...she makes everyone smile, especially when wearing her cool shades! And everyone takes her picture! Sassy is 5months old now, and she's full of energy. She's graduating puppy1class this saturday. Then, she's going to puppy2 classes. Princess just got her goggles today and seems happy to get lots of treats just for keeping them on. Ophthalmologist recommended the goggles due to rough play with her brother Bam Bam and the possibility of another cornea injury. She still on medications and want to keep her eye as healthy as possible. I gotta say that your customer service is outstanding as I had problems with my shipment (USPS misplaced the package) and I was guided by your representative every step of the way. Thanks a lot!!!! Cuddles is posing in her new Doggles...These are the crowd favorite..She rides in the back seat of my car and sticks her head out the window with her Doggles on and everyone in cars next to us love the look and takes her picture...she loves the attention..
Starla is ready to go camping! Chloe is 1 1/2 years old "Pek-e-tese" Pekeginese-Maltese breed. She's full of tons of engergy and tons of kisses. She's very smart but very stubborn also. TIA LOVE HER DOOGLES FROM BAXTER BOO!! My new disguise. Am I cute?? Or what??? When there is sliced turkey in the mix....."what doggles?" I know I know, I look soooo cute in my new glasses! Stella kickin' back on another beautiful day of boating! Lovin my new glasses, you like? Lula is ready for Hollywood!!!! Im only 8 weeks, and already too cute for my new Dogggles! 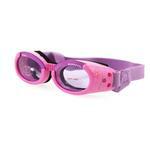 I'm ready to ride wearing my brand new purple Doggles! Confident and adventurous, Puck loves riding with his pet people in their antique cars and is also confident enough in his masculinity to wear pink. wolfie enjoys her new doggles as much as her new cut for the summer. here she is hanging out the passenger window. 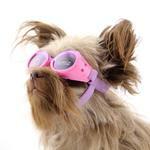 Here's MuMu sportin' her Doggles Goggles - JUST TOO COOL! Oscar's Red Carpet here she comes! Reggie sporting her new Doggles she got from Baxter Boo! Zoe recently lost her left eye but she now has some awesomely cool Doggles to help protect the remaining big ole eye. Missy and Vic love to ride in the Sidecar we built for them. The Doggles are great for them. And they Love them! Not to mention they are really cute. Posted On 07/23/17 by Milliegirl from Winston-Salem, NC Yes, Milliegirl recommends this product! Cavalier eyes will need protection at the beach. These are perfect. Love BaxterBoo! Posted On 04/25/17 by Pam K from Peterson, IA Yes, Pam K recommends this product! Posted On 05/23/16 by Vicki H from Post Falls, ID Yes, Vicki H recommends this product! 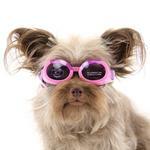 We have a 15# Shih Tzu & these goggles fit perfectly. We take him on ATV rides where there's lots of dust & these doggles keep his eyes dust free. Posted On 02/28/16 by Carolyn R from , KS Yes, Carolyn R recommends this product! Love the Doggles, fit & look great. Posted On 06/07/15 by Shannon L from Sharpsburg, MD Yes, Shannon L recommends this product! oh my gosh - I so LOVE these Doggles! they are absolutely priceless and just too cute to pop on my little Finian . . . . . LOVE the color and style - very feminine which is what I wanted! They fit great and provide much needed protection against the rays for when she is outside - and that is also what I wanted! I had been pricing these at other places and once again BaxterBoo had the BEST price - so kudos to BaxterBoo for hitting it out of the park yet again and carrying the best and adorable products so our fluffs can be stylin!!! Posted On 03/18/15 by Lynn G from Riverview, FL Yes, Lynn G recommends this product! Not only does Tinkerbell look so stylish and super cute in her new Doggles Sunglasses, but her eyes are protected. She has a problem with bright sunlight and the vet suggested she wear sunglasses when she goes out in the daytime. These are perfect!!! Posted On 02/24/15 by karen k from Walnut Creek, CA Yes, karen k recommends this product! 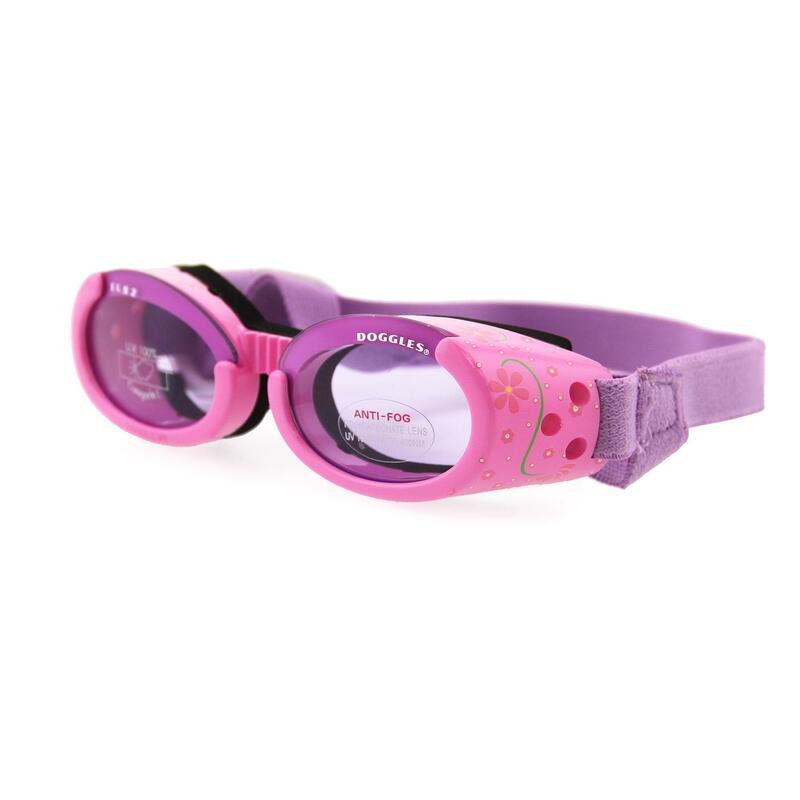 I love my dogs new goggles-love the color and the size is perfect. They are made really well nice and strong. I hope my dog likes wearing them. what an awesome concept.. we have a puppy and she wears them with pride.. cant wait for spring with the jeep top off and her in her doggles. Posted On 10/24/14 by Debra T from Bakersfield, CA Yes, Debra T recommends this product! I purchased a second pair for other car. Since finding Baxter Boo, they are the on-line company I purchase from for my baby Jade. Their choices far out number any other on line company. Their quality is exceptional and items are True to size. I love that Baxter will periodically run specials. Their web site is very easy to maneuver. All of the articles I've purchased so far have washed beautifully, and still look like New. I'm a very happy with Baxter Boo and just recommended themt to our neighbor who adopted a shelter pup!